For an island like Mallorca, which is heavily dependent on tourism, protecting the landscape and countryside by having a waste management model based on zero dumping is not a whim, but an obligation. 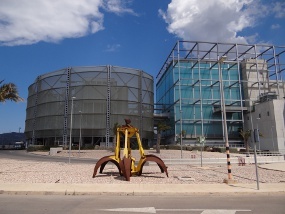 In pursuit of this goal, the construction of Mallorca’s first waste-to-energy (WTE) plant was approved in 1992, and the contract for its design, construction, and management was awarded to TIRME S.A. Construction of this environmentally advanced and economically viable facility at the Son Reus site was completed in 1996. Each of these first two lines (lines 1 and 2) is capable of handling 18.75 tons of municipal waste per hour, and the waste heat is used to drive a turbine and generator that produced 24 MW of electricity for the power grid. In 2007, work began to construct two additional 27 t/h lines (3 and 4), each of which has a water cooled grate firing system. Together, they are able to handle approximately 420,000 tons of solid waste per year. As this waste has an average calorific value of 8,500 kJ/kg, the two lines each have a thermal capacity of 140 MW(70MW+70MW). Producing 400 deg. C steam at 50 bar, they are able to generate 38 MW of electricity. With lines 3 and 4 now online, the Son Reus WTE plant now produces enough electricity to meet the needs of 53,000 households, and is equivalent to about 4.7% of Mallorca’s total power consumption. The ash (slag) from the combustion process is treated in a plant, and approximately 80% of the resulting material is used in cement and road construction materials. 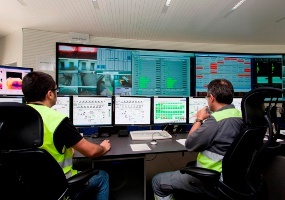 For this expansion of the Son Reus WTE facility, Yokogawa Iberia S. A was selected at the automation contractor, in which capacity it installed the CENTUM CS3000 production control system (PCS), ProSafe-RS safety instrumented system (SIS), Exaquantum process information management system (PIMS), the Plant Resource Manager (PRM) asset management system, and various FOUNDATION™ fieldbus devices. As Mallorca’s population of 1,000,000 can swell to six times that figure during peak holiday periods, the TIRME WTE facility must be prepared to handle widely fluctuating volumes of waste. Add to that the fact that the waste itself is of many different types, which presents certain challenges in and of itself during the combustion phase. On average, the plant processes each year 200,000 tons of municipal waste, 6,000 tons of sludge from a wastewater treatment plant, 3,000 tons of sanitary waste, and 150,000 tons of refuse-derived fuel (RDF). The monitoring and control of the various processes that are employed at this WTE facility is very demanding and complex. Incoming waste must be weighed and unloaded from trucks before being fed in carefully controlled amounts to water-cooled grates in the furnaces on lines 3 and 4, where a minimum flue-gas temperature of 850 deg. C must be attained. Combustion air to each of the furnaces is supplied by independent primary and secondary combustion air systems, with the former drawing in air from the reception bunker (thus preventing the escape of odors), pre-heating it, and injecting it into the lower part of the furnace, and the latter feeding secondary air into the upper section of the furnace. Each furnace is fitted with two auxiliary burners to support the combustion process. The heat energy of the flue gasses from each of the furnaces is recovered in two boilers (one per furnace) that produce the steam (400 deg. C, 50 bar) needed to drive a turbine. The feed water supplied to the boilers is pre-treated at a desalination facility using reverse osmosis and resin ion exchange processes. The water is fed into the boilers by three pumps (one per line, plus one standby pump) that deliver a maximum flow of 120 t/h at 100 bar. In all of these processes at this WTE plant, safety is the top priority. 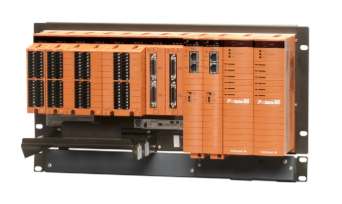 A robust and reliable integrated control and safety system (ICSS) made up of the CENTUM CS3000 PCS and the ProSafe-RS SIS ensures safe operations while fully automating key processes such as the supply of combustion air and feed water while ensuring that the combustion temperature never falls below 850 deg. C.
The boiler emergency shut down function is configured in ProSafe-RS, which features the same engineering environment and HMI screens as the PCS. 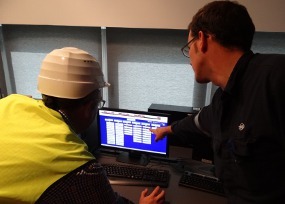 Working from their HMI stations in the central control room, operators enjoy ready access to information on processes throughout this facility and are able to take timely and correct action to ensure safe operations at this facility 24/7/365. To safeguard the environment, all flue gases are carefully treated before being released out the stack. Exiting each boiler at 180 deg. C, the flue gases enter a gas treatment system that employs a gas cleaning line (one per incineration line) with a nominal flow of 145,000 Nm3/h). This is a semi-dry scrubber (Turbosorp) that works in combination with a fabric bag filter and a high-temperature SCR DeNox system. The acid gases are neutralized in a turbo reactor and dry activated carbon and calcium hydroxide are injected to absorb heavy metals, dioxins, and furans. The gases then go to the bag filter, which separates all the products created by the preceding reactions. Subsequently, the gases are heated by heat exchangers to a temperature of 250 deg. C and nitrogen oxides are eliminated by the addition of ammonia in the presence of a catalyst (the SCR DeNox process). Finally, the completely clean gases are released through the stack at a temperature of 170 deg. C. A variety of analytical instruments accurately measure the concentrations of key components, and this data can be monitored and controlled by the Yokogawa PCS. This data is also gathered by the Yokogawa Exaquantum PIMS for reporting and further analysis to ensure the sustainable operation of this WTE facility. A fly ash stabilization facility is installed in the flue gas cleaning area to treat and store the incineration residue. Once the ash has been inerted, it is sent by truck to a controlled safety landfill located adjacent to the facility. The other by-product of incineration is slag, which is formed mainly from the arid, ferrous, and nonferrous waste fractions. The slag falls at high temperature from the furnace grates to a bunker. From this pit, it is collected by a gantry crane and unloaded onto a vibrating screen. At an adjacent plant that is capable of handling 120 tons of slag per hour, the slag is converted to materials that can be used in cement production and road construction. Simon Gili Planas, project manager: "Our WTE plant has four main processes: waste treatment, the water-steam cycle, energy generation, and slag treatment. 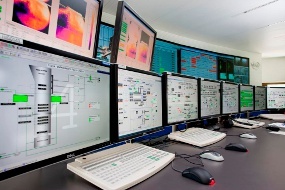 Thanks to the integration of the ICSS with sub-systems like the Siemens steam turbine, crane system, and SCR DeNox system, our personnel in the central control room are able to keep tabs on operations throughout the entire plant. Yokogawa’s systems and non-system products have proven to be very reliable, and we are very happy that there have been no major systems related problems and that we have been able to keep the plant operating nonstop year-round. This helps us comply with the urban waste master plan for Mallorca and with national waste handling guidelines. Our data are always well within European standards as well." Diego Rodriguez-Losada Sada, staff member, maintenance department: "Our ICSS is working nicely and is easy to operate. Engineering for the PCS and SIS can be done from the same engineering work station. This reduces workload and helps prevent mistakes. 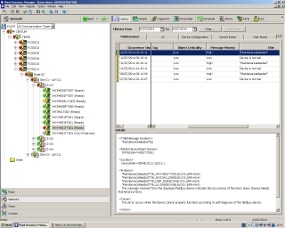 The Plant Resource Manager (PRM) asset management package collects data from the FOUNDATION™ fieldbus field devices. Maintenance engineers can easily confirm all the parameters and diagnostic data for these field devices in the device viewer window, and schedule field device checks. This allows us to take a predictive maintenance approach."